concealer – Yeah.. like the mermaid. Finding a good concealer feels so much trickier than it should. There are so many different kinds — from liquid, to cream, to stick, to powder. Then there is the quintessential problem every girl has — finding the perfect shade. You need something lighter for the eye area, something green or yellow to neutralize redness and blemishes, and something that matches your skin tone perfectly. Our skin changes so much from day to day, too. Some days I have plenty of blemishes and marks to cover up (thanks, hormones!) and other days I barely need any coverage. Some days my skin is uneven and red, and other days it’s too oily. In the summer, I’m always slightly darker than in the winter, so my skin tone changes a bit. It’s virtually impossible to find one single solitary concealer that works on me all the time. 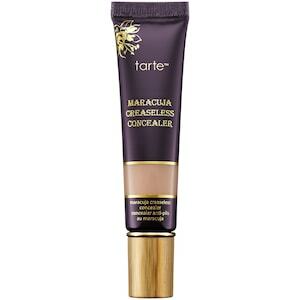 For the past few months, I have been using tarte maracuja creaseless concealer. At $25, it’s a bit pricier than drugstore brands but not by much. I have some pros and cons for it as I still try to figure out if it’s worth buying a second tube. tarte’s website has a great, easy-to-use shade finder that takes all the guesswork out of picking the perfect shade. this concealer, in particular, has 14 shades, which is fantastic but could make narrowing it down tricky. but I was able to easily pick the shade for me (fair skin with pink undertones) without even going to a store — great for online ordering. it’s definitely full-coverage which is perfect for deep marks. a little goes a long way. i’ve been using the same tube daily for five months (!!) and am not even close to running out. that’s impressive. it has a nice, creamy consistency. it does not make me break out, which is always appreciated. apparently it’s vegan, too, which is a nice bonus. it is definitely not creaseless. at all. in fact, it creases quite a bit. I have to check myself in the mirror about a half hour after applying to clear up the annoying crease marks. it slides a bit on the skin, possibly because it’s very thick, giving your skin an oily feel. this is probably fine for drier skin but for oily girls, I’d watch out. the tube is THE most annoying thing. too much comes out at one time and it’s impossible to get it back in, so you end up wasting a lot or trying to cover spots that don’t really need it to avoid wasting the product. if you accidentally store it right side up in your makeup kit, it gets all over the cap. it’s not incredibly long-lasting. it’s fine for normal days where you’re not really active, but I feel if you’re doing any activity, it fades fast. I usually apply it first and then set with a powder/bronzer and blush on top and this works well for me. My favorite trick is to apply it after primer on eyes but before eye makeup, it beautifully gets rid of those yucky looking eyelid veins. It makes the eyelids look even and bright — so much so that I’ve skipped eyeshadow and still looked wide awake. But the fact that it creases is really annoying (especially because ‘creaseless’ in the title ..I mean, come on.) and doesn’t last long is quite dissappointing, hence why I am not sure it’s worth buying again. what’s your favorite concealer?